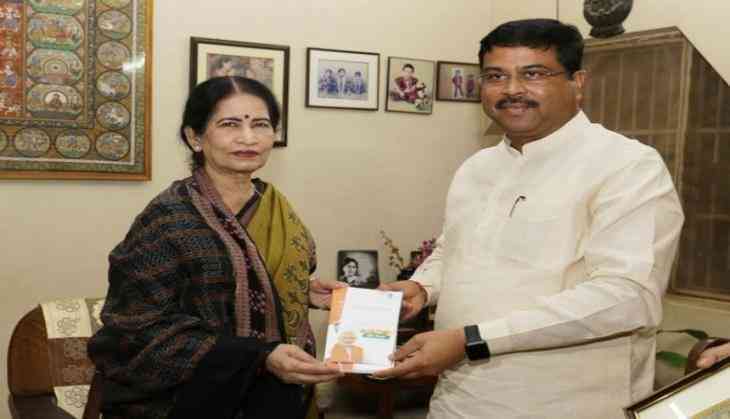 Union Minister Dharmendra Pradhan on Thursday met eminent Odia author Pratibha Ray at her residence in Bhubaneswar as part of 'Sampark for Samarthan' campaign. Pradhan presented Ray a book on the key developments and achievements of four-year of Prime Minister Narendra Modi Government. Launched in May this year, Sampark for Samarthan initiative was devised to generate awareness about the Prime Minister Modi-led government's achievements in the last four years. In the run-up to the 2019 Lok Sabha polls, Shah will reach out to 50 people personally with details of initiatives and achievements of the government, whereas each BJP worker is expected to contact at least 10 people. There will also be a special session of 'Sampark for Samarthan' on the NaMo App.